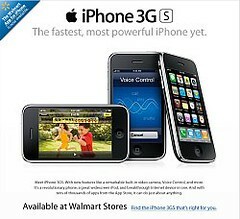 Beginning today, WalMart will be selling the popular 3GS Apple 16 GB iPhone for a rock bottom price of $97! There is a catch, this price is for the purchase of a new phone with a 2 year contract. This discount is in advance of Apple introducing its’ new iPhone next month. Experts expect Apple will reduce its’ current price of $199 to around $99 for this model matching WalMart’s price.